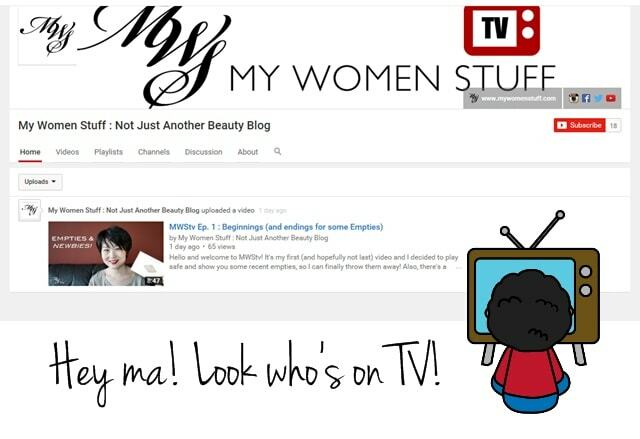 Home » Musings » Welcome to MWStv : Hey ma! I’m on telly! Welcome to MWStv : Hey ma! I’m on telly! Guess who’s now live and on TV. No, go on, guess. LOL Ok, enough of the teasing. I’d like to welcome you to my new little project – MWStv, which is basically my swanky name for my brand new YouTube channel. Yes, I’ve only just gone and set up a YouTube channel! Eeps! I had intended to share this piece of news in the coming week, but it sort of sprouted a life of its own and got out there (as will happen), so I didn’t think it fair to keep it under wraps any longer. But to manage your expectations, I probably will not be teaching things the way many do on YouTube. I’ll leave makeup to experts like Lisa Eldridge and skincare to Caroline Hirons, both of whom do an insanely impressive job that I cannot hope to replicate. I can barely put makeup on myself, much less teach anyone anything and I already have my blog as my primary voice, so product reviews, stories and my thoughts will always end up here first. I haven’t quite thought of what I’d feature next so I’m open to ideas and suggestions of what you’d like to see. I will likely share some bits and bobs of what’s new and upcoming in beauty-land, as there are quite a few new things coming up but beyond that, I’m open to suggestions. Thank you for your continued support and encouragement. I’d love to hear from you, naturally! And if you’re up to it, you can subscribe to MWStv here! PREVIOUS POST: In the mornings, when I use this Antipodes cream cleanser, my skin sings Hallelujah! You appear pretty natural – it was a pretty great watch! Wow! You are prettier in motion than in still photos! Not only pleasant to watch but you also have a very good speaking voice and good content. Well done for a first try! Hi Paris, I discovered your blog earlier this year as I ventured (albeit in my 40) into proper skincare and rudimentary makeup. I have binged read all your posts. Love the way you write and your sense of humor. And admire that you take the time to reply to every comment. Very admirable in my books. Watched your video and a big thumbs up to you. Keep it coming on. Finally mustered my courage to post something on your blog. Hi there Santhi! Thank you for sharing your comment and for the support and encouragement! I’m glad you’ve enjoyed your time on MWS and you know, it’s never too late to look after our skin 😀 I’m glad you posted a comment. I love hearing from everyone! Oh… I’ve been wanting to start video blogging too. But I get held back when I see myself on the video. Now I get encouraged to do it after watching your video. This is so exciting, congratulations! Love the video, and can’t wait to see more. Awesome first video! And love your lipstick too! I love it! Empties are always welcomed. Next, I would like to see the things that you have swept under. Are there products that you simply leave at the back of your drawer or bottom of the cabinet because you feel only so-so about?